Call A1 Overseas International at 1-800-450-5319 to discuss your upcoming shipment to Greece or fill out our form for a FREE quote! International auto transport is a service that is designed to make traveling in foreign countries a relaxing experience. Having a personal vehicle in Greece will make navigating unfamiliar territory far more convenient because you will be able to explore on your time whereas public transportation can interrupt your schedule. 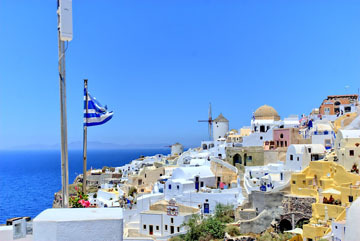 Anyone can import their vehicle to Greece by taking advantage of the vehicle shipping solutions that A1 Overseas International makes available. Roll on Roll off- Travelers on a budget should consider this method of transportation because it is the least expensive option. The regulations for this method of transportation must be met to ensure good quality for not only you, but fellow customers of A1 Overseas international. There are a few things to remember about this type of shipping such as, your vehicle will be exposed to the elements, all vehicles must be in working order and no personal items are allowed inside of the vehicle. Container Shipping- Exporting a vehicle inside of a container will provide more peace of mind because the elements are taken out of the equation. Container shipping offers four walls of protection against mother-nature and the regulations aren’t as strict. Another positive aspect with this method is that you have the option to ship additional items with the vehicle. Shipping a vehicle overseas might sound very expensive, but in reality, you might be saving much more of your cash when you take in to account how much cab services charge. Professional shipping companies like, A1 Overseas International calculate the cost of transporting a vehicle to Greece based on a few different factors. Weight, distance and the method of shipping all play a role in how much you will be paying for their services.